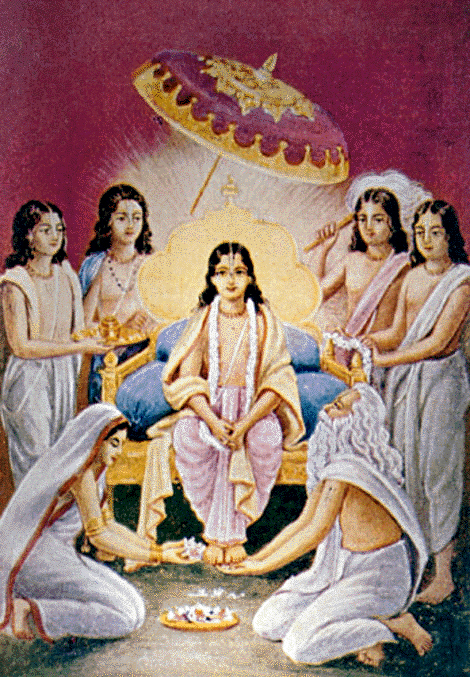 advaita ācārya—Advaita Ācārya; nityānanda—Lord Nityānanda; śrīnivāsa—Śrīvāsa Paṇḍita; gadādhara—Gadādhara Paṇḍita; dāmodara—Svarūpa Dāmodara; murāri—Murāri Gupta; haridāsa—Haridāsa Ṭhākura; āra—other; yata—all; caitanya-kṛṣṇera—of Śrī Kṛṣṇa Caitanya; bhakta-gaṇa—devotees; bhakti-bhāve—with a devotional attitude; śire—on my head; dhari—I take; sabāra—of all of them; caraṇa—the lotus feet. Bowing down with devotion, I hold on my head the lotus feet of Advaita Ācārya, Nityānanda, Śrīvāsa Paṇḍita, Gadādhara, Svarūpa Dāmodara, Murāri Gupta, Haridāsa and all the other devotees of Śrī Kṛṣṇa Caitanya..
śrī-murāri gupta—of the name Śrī Murāri Gupta; śākhā—branch; premera—of love of Godhead; bhāṇḍāra—store; prabhura—of the Lord; hṛdaya—the heart; drave—melts; śuni’-hearing; dainya—humility; yāṅra—of whom. pratigraha nāhi kare—he did not accept charity from anyone; nā—not; laya—take; kāra—anyone’s; dhana—wealth; ātma-vṛtti—own profession; kari’-executing; kare—maintained; kuṭumba—family; bharaṇa—provision. Śrīla Murāri Gupta never accepted charity from friends, nor did he accept money from anyone. He practiced as a physician and maintained his family with his earnings. cikitsā—medical treatment; karena—did; yāre—upon whom; ha-iyā—becoming; sadaya—merciful; deha-roga—the disease of the body; bhāva-roga—the disease of material existence; dui—both; tāra—his; kṣaya—diminished. As Murāri Gupta treated his patients, by his mercy both their bodily and spiritual diseases subsided. jaya—all glories; dāmodara-svarūpa—of the name Svarūpa Dāmodara; jaya—all glories; murāri gupta—of the name Murāri Gupta; ei saba—of all these; candra-udaye—such moons having arisen; tamaḥ—darkness; kaila—made; lupta—dissipated. dāmodara-svarūpa—of the name Svarūpa Dāmodara; āra—and; gupta murāri—of the name Murāri Gupta; mukhya-mukhya—most important; līlā—pastimes; sūtre—in notes; likhiyāche—have written; vicāri’-by mature deliberation. sei—that; anusāre—following; likhi—I write; līlā—pastimes; sūtra-gaṇa—notes; vistāri’-very explicitly; varṇiyāchena—has described; tāhā—that; dāsa-vṛndāvana—Vṛndāvana dāsa Ṭhākura. rāḍha-deśe—the place where there is no Ganges; janmilā—took birth; ṭhākura nityānanda—Nityānanda Prabhu; gaṅgādāsa paṇḍita—of the name Gaṅgādāsa Paṇḍita; gupta murāri—of the name Murāri Gupta; mukunda—of the name Mukunda. tabe—thereafter; sapta-prahara—twenty-one hours; chilā—remained; prabhu—the Lord; bhāva-āveśe—in ecstasy; yathā—anywhere; tathā—everywhere; bhakta-gaṇa—the devotees; dekhila—saw; viśeṣe—specifically. 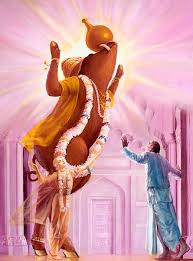 After this incident, the Lord remained in an ecstatic position for twenty-one hours, and all the devotees saw His specific pastimes. In the Deity’s room there must be a bed for the Deity behind the Deity’s throne. (This system should immediately be introduced in all our centers. 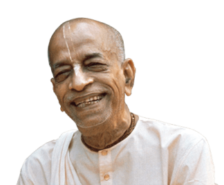 It does not matter whether the bed is big or small; it should be of a size the Deity room can conveniently accommodate, but there must be at least a small bed.) One day in the house of Śrīvāsa Ṭhākura, Lord Caitanya Mahāprabhu sat down on the bed of Viṣṇu, and all the devotees worshiped Him with the Vedic mantras of the Puruṣa-sūkta, beginning with sahasra-śīrṣā puruṣaḥ sahasrākṣaḥ sahasra-pāt. This veda-stuti should also be introduced, if possible, for installations of Deities. While bathing the Deity, all the priests and devotees must chant this Puruṣa-sūkta and offer the appropriate paraphernalia for worshiping the Deity, such as flowers, fruits, incense, ārati paraphernalia, naivedya, vastra and ornaments. All the devotees worshiped Lord Caitanya Mahāprabhu in this way, and the Lord remained in ecstasy for seven praharas, or twenty-one hours. He took this opportunity to show the devotees that He is the original Supreme Personality of Godhead, Kṛṣṇa, who is the source of all other incarnations, as confirmed in the Bhagavad-gītā (10.8): ahaṁ sarvasya prabhavo mattaḥ sarvaṁ pravartate. All the different forms of the Supreme Personality of Godhead, or viṣṇu-tattva, emanate from the body of Lord Kṛṣṇa. 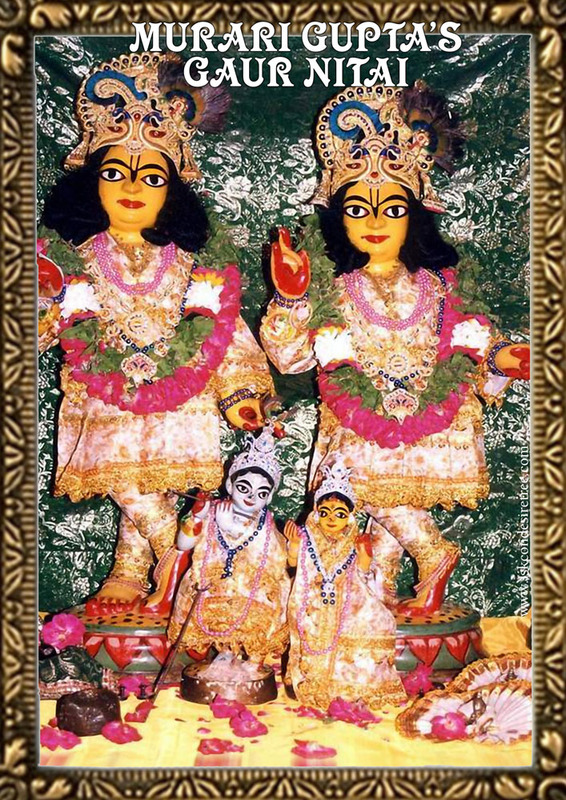 Lord Caitanya Mahāprabhu exposed all the private desires of the devotees, and thus all of them became fully confident that Lord Caitanya is the Supreme Personality of Godhead.